Passed away peacefully at home on Tuesday, May 22, 2018. Born in Palmerston, Ontario on December 8, 1938. Predeceased by her parents James and Eula Murphy. 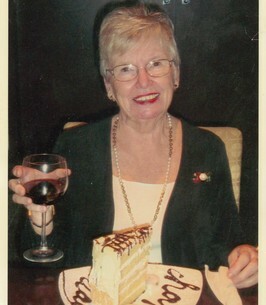 Beloved wife of the late Terry Doyle (2005). Dear mother of Michael (Joanne) and David (Karen). Dear Nanny to Rosalynne, Ryan (Rachel), Rebecca (Dan), Erica, Dylan, Jake and Josh. Great-Nanny to Zack, Hailey, Harvie and Tanner. Dear friend of the late Doug Neal since August 8, 2009. A memorial visitation will be held at the Gilbert MacIntyre & Son Funeral Home, Hart Chapel, on Sunday, May 27th from 2-4 and 7-9 pm. At Joyce’s request, no services will be held. A private family gathering will be held at a later date. We encourage you to share any memorable photos or stories about Betty. All tributes placed on and purchased through this memorial website will remain on in perpetuity for future generations. David, Mike & families, No words can describe how sorry I am for the loss of your mother. My heart goes out to all of you during this difficult time. Extending heartfelt condolences at this difficult time, so sorry to hear the news of your Mother’s passing, our thoughts and prayers are with you at this time of sorrow. Remembering a lovely lady from our Norfolk Street United days. I was very sad to learn of Joyce's death. She and I worked together at the University of Guelph for five years. She was my secretary in the Dean's Office, College of Arts and I was very fortunate to have her there for that period. She was a wonderfully caring person, highly efficient and the source of a lot of fun that characterized the Dean's Office. Even though I am unable to attend the visitation this weekend, I shall think of her with the fondest of memories. Thank you again, Joyce, for all that you did and all that you meant to me and to the university.